Tofu is definitely one of those things I’ve had to learn to love, and it’s taken me a long time to get to this point. Turns out if you show it a little bit of TLC you get a lot in return. 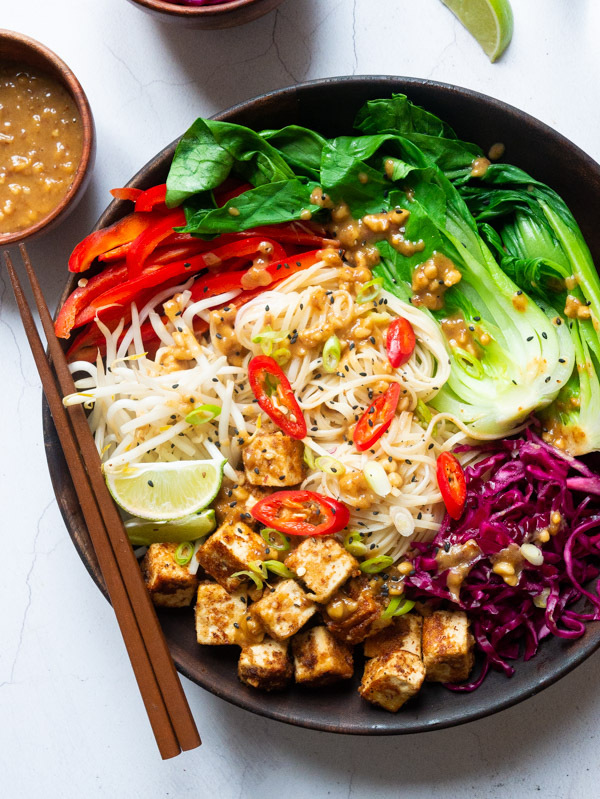 And that’s what I’m going to show you today with this B-E-A-UUUUU-tiful Peanut Tofu Noodle Bowl. The star of this dish has got to be the peanut sauce. It’s salty, tangy and a little bit sweet. And it is THAT that we are throwing on our tofu to take it up a notch. 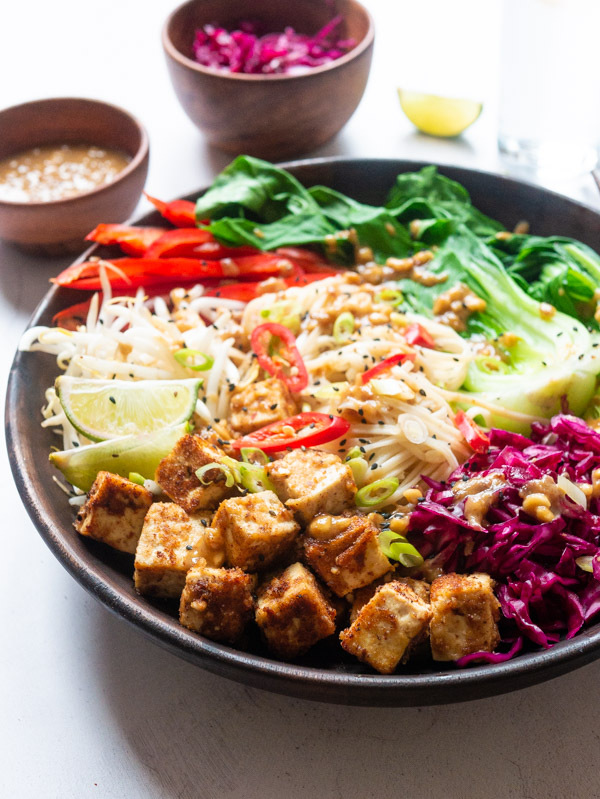 It works as both a marinade to the tofu and dressing for the whole bowl. Guy Fieri would be taking a trip to flavour town were he here to eat this. To add to the flavours and textures in this bowl I’ve thrown in a quick pickled red cabbage. 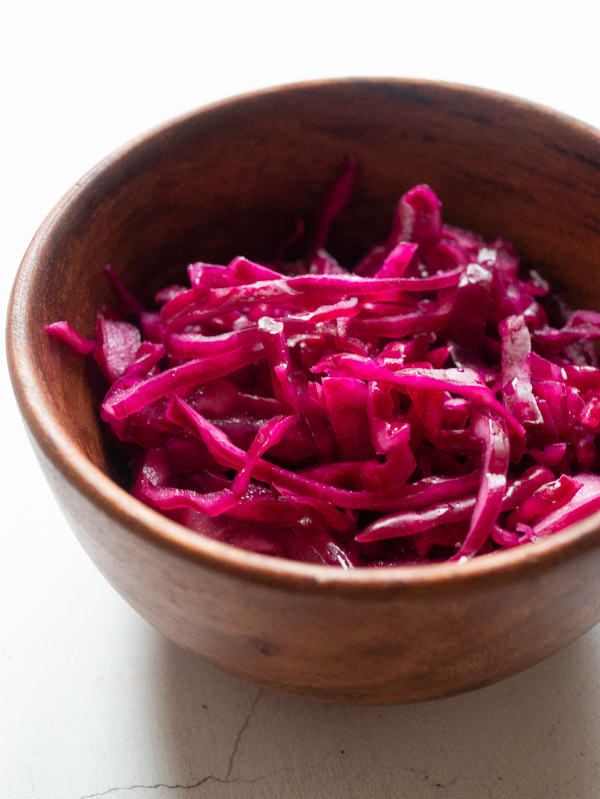 It’s a super simple mix of red cabbage with rice vinegar, salt and sugar which gives you a fantastic quick, crunchy pickle. Is your mouth watering yet? 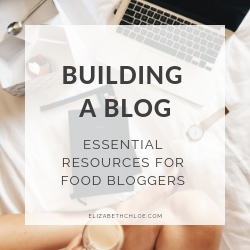 What type of tofu to use? For recipes like this one, as well as other stir-fries and savoury dishes firm tofu is best. The firmer the better. I like to use tofu from the Tofoo Co. or Cauldron. Both have a really great texture. Silken tofu is great for desserts (remember that Vegan Chocolate Orange Tart?) or thrown in miso soup. Drain off any excess water from the tofu, then grab some kitchen paper or a clean tea towel and lay it down, rest the tofu on top and then cover it with more kitchen paper or tea towel. Place something weighted on top (I like to use a chopping board with a few tin cans but you could use a saucepan or cast iron pan – whatever you’ve got on hand). Leave it for at least 10 minutes, but the longer the better. If you decide to leave it for longer you will need to change the kitchen paper halfway through. Slicing the tofu in half horizontally before draining it helps it drain more efficiently. Once cooked, store in an air-tight Tupperware container in the fridge for 2-3 days. Yup! This would taste great cold and would be an ideal packed lunch to take to work. If you want to reheat this you have a couple of options, separate the cooked things (tofu, noodles, bean sprouts, bok choi) from the cold things (pickled cabbage, peanut sauce pepper, lime wedge) and use a microwave to heat the cooked items before mixing them with the cold. Alternatively, you could warm everything up in the microwave for 2-3 minutes, giving everything a stir halfway through. It is done when everything is piping hot. 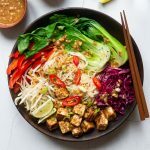 Can this Peanut Tofu Noodle Bowl be frozen? This dish is best eaten fresh and I would advise against freezing as it will affect the textures of the tofu and vegetables. Other vegan dinners you should try ASAP! The peanut sauce that accompanies this dish is also a marinade for the tofu. Plus there’s a quick pickled red cabbage for extra crunch! Prepare your tofu: Slice your tofu in half and lay it on several pieces of kitchen paper or a clean tea towel then place further kitchen paper or another clean tea towel on top of the tofu. Place a flat surface, such as a chopping board or flat plate, on top of the tofu along with a light weight (I use a few tin cans). This helps drain water from the tofu. Leave the tofu to drain for 10 minutes while you make the peanut sauce. Prepare the peanut sauce: Make the peanut sauce by adding all of the ingredients into a bowl with 2 tablespoons of warm water. Whisk everything together until it is fully incorporated. Marinate the tofu: Once the tofu has drained discard your kitchen paper or tea towel and slice the tofu into 1 cm cubes. Dip each cube into the peanut sauce and leave on a plate to marinade for 10 minutes (or more if you have the time). Prepare your quick pickled cabbage: Place the sliced cabbage into a bowl with the vinegar, sugar and salt. Use your hands to scrunch everything together – the salt and sugar along with the scrunching help break down the cabbage a little bit and it begins to release some juice. 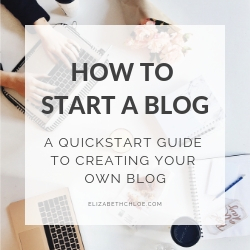 Do this for 1-2 minutes then set aside until you are ready to serve. Cook the tofu: Heat a frying pan on a medium heat with a tablespoon of oil. Add the tofu to the pan and cook for 30 seconds to one minute on each side until it is golden brown on the outside. You may want to cook the tofu in batches depending on the size of your pan. Cook your noodles and veggies: Bring a large saucepan of water to boil. Add your noodles and cook as per packet instructions. In the last minute of cooking add the bok choi and bean sprouts and cook for one minute until the veggies are tender. Drain the noodles, bok choi and beansprout. 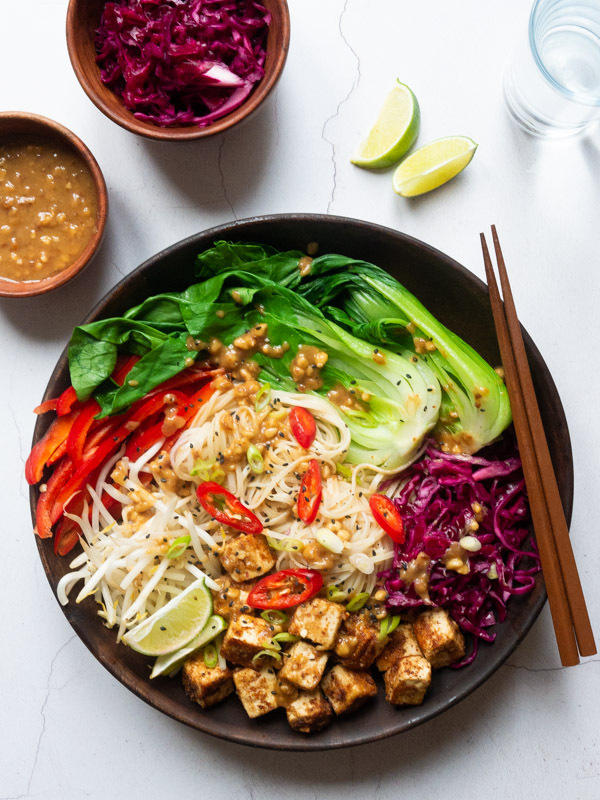 To serve: Add the noodles to bowls with the bok choi, bean sprouts, red pepper, tofu and red cabbage. Top with a drizzle of the peanut sauce and any other toppings you fancy. Enjoy! Honestly, i thought i hated tofu. I have tried a few of Elizabeth Chloe’s other recipes though and they were great so i thought I’d give it a go. Totally blew me away! Packed full of flavour and not at all slimy like i was expecting.